Find your Niche with versatile and modern Niche Fabric Storage Bins! Strong and durable, these bins each include a reinforced bottom panel that adds an extra layer of stability. With the bottom panel in place, they are sturdy enough to use on their own to hold files, scrapbook paper, children's toys, towels, craft supplies and more. The bottom panel comes out and the entire bin folds flat for easy storage when not in use. Folded bins even fit perfectly inside an open one! Chrome handles are built into two sides of the bin, which makes carrying and moving it easy and worry-free. Inset handles are stronger than sewn-on cloth handles and won't come unstitched or separate at the seams like cloth handles could. Measuring 12 x 12 x 12, Niche Fabric Bins are truly square and integrate seamlessly into Niche Cubo storage cubes. They can be used in any direction- there is no "right" side to face front becuase all sides measure the same! Personlize your bins by using the clear label holder on one side. Quickly and easily identify contents or assign bins to individual students. 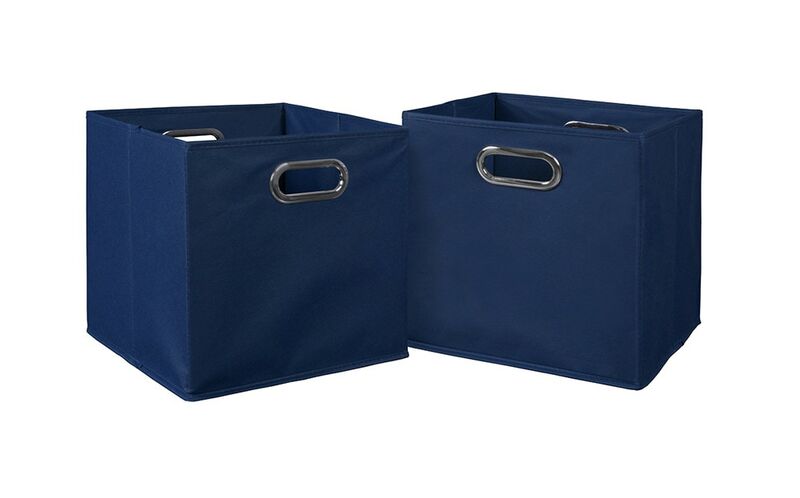 Ideal for every room in the house, make this set of 2 Blue Niche Folding Fabric Bins a part of your home or office today! CUSTOMIZE WITH LABELS- Quickly and easily identify bin contents by using the clear label holder on one side. With a visibile area of 4" x 2.25", there is plenty of room to personalize, list contents, assign bins to individual students or display pictures to help keep children organized.